So much hullabaloo has surrounded the act of the slurp. It’s so taboo in Western culture that it’s obnoxious affront to manners is used perfectly in the scene of my favorite movie Clue. Slurping your soup at the local Olive Garden will surely draw some stares. There are some who have put a name to the annoyance of hearing others eat. Check out this Buzzfeed article here. It’s an interesting phenomenon- that some kind of sensory input can disturb us so much – how much is the sensory input and how much is the offense that our sensible brain attaches to it? I think it says a lot about how conditioned we are as humans and as animals. For ramen and soba and all Japanese noodles and soups, the food custom and etiquette is to slurp. A lot of guides and well-meaning folks will tell you that it is a way to compliment the chef. I don’t think a slurp is a means of telling the chef how much you like the food, but a clear sign that you are eating the food hot and fresh – as the chef had hoped. 2. to take in air with your food. For #1 I am hoping that is self explanatory. 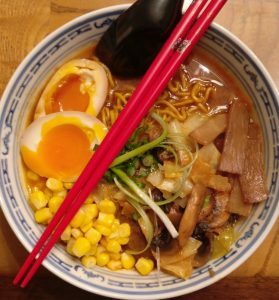 Your piping-hot broth will not have contact time on your lips, cheeks, or soft palate and the fast moving air will rapidly cool the soup. You didn’t cool down the whole bowl of ramen, just that one bite. Hotter soup, better experience. For #2 we bring into the spotlight an interesting thing that humans do. We can detect odors and tastes when inhaling AND exhaling. Retronasal olfaction is how you detect tastes and odors after slurping up noodles. You draw up air as you take in noodles and swallow. As you swallow, you exhale, adding to the flavor effect. I doubt this is specific to humans but we can aerosolize flavors against our taste buds and as we swallow we exhale flavored air over our sinus cavities. The Japanese are seriously hilarious about this. Think of kissing an infant who is in your arms but doesn’t wanna be kissed. You’re pursing your lips but not yet making contact. Now, get over it. Get your face over the bowl. Grab 3-5 noodles. Use a fork, use chopsticks, whatever. Put em in your mouth. It hurts. Life is pain. Make the kissy face. Use your diaphragm and inhale. Your mouth spout will create a spray of soup in your mouth. Don’t stop till the noodles are all in the mouth. Chew and exhale. Repeat forever. Live happy.